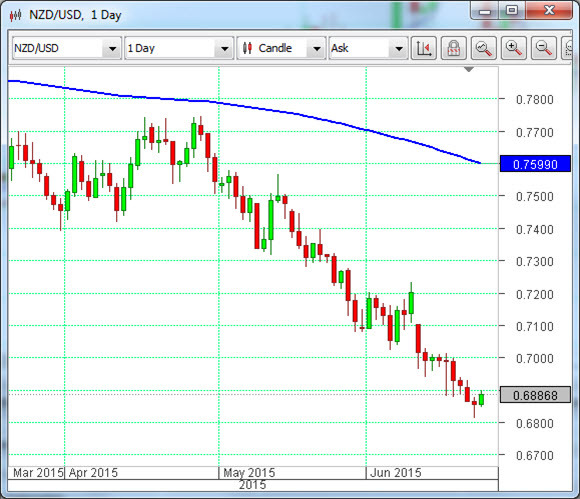 The New Zealand dollar, otherwise known as the Kiwi, is at the lowest level against the US dollar for five years. This collapse has taken place over the past two months. The fall has been unremitting and aggressive. So what brought it about? The answer lies in a number of places. For quite some time now the Reserve Bank of New Zealand (RBNZ) has been concerned about the strength of the currency, which was driven up on the back of interest rate differentials between the New Zealand rates and those of other jurisdictions. The Kiwi is a long standing member of the group of currencies that have been favoured by the Carry Trade, that group of investors who scour the globe seeking jurisdictions that have a disparity in interest rates, so that they can borrow at low interest and loan out at high rates. It is also a commodity currency, where the country concerned makes most of its foreign revenues from the export of one or more basic commodities. The central bank has long tried to talk down the exchange rate, because a strong NZD hurts exports. This was only partially successful. Another way to lower the value of the currency would be to reduce interest rates, but this would have a detrimental effect on house prices in the cities, where investors, in particular, would borrow to purchase residential property, and cause a bubble. Now the global economy is coming to the assistance of the New Zealander monetary authorities. Dairy produce prices are falling on the back of increased international competition and cutbacks in China, and dairy products are the most important export. The Federal Reserve in the US has signalled interest rate rises in the near future, which will reduce the Carry Trade differential. The RBNZ has let it be known that is is not afraid to enter the Forex market to sell NZ dollars, if all other measures do not work. Then, to accelerate the tendency for a fall, Gross Domestic Product figures for New Zealand have been much lower than previously expected. The end result of all of this is a precipitate fall in the value of the Kiwi, which we have seen.